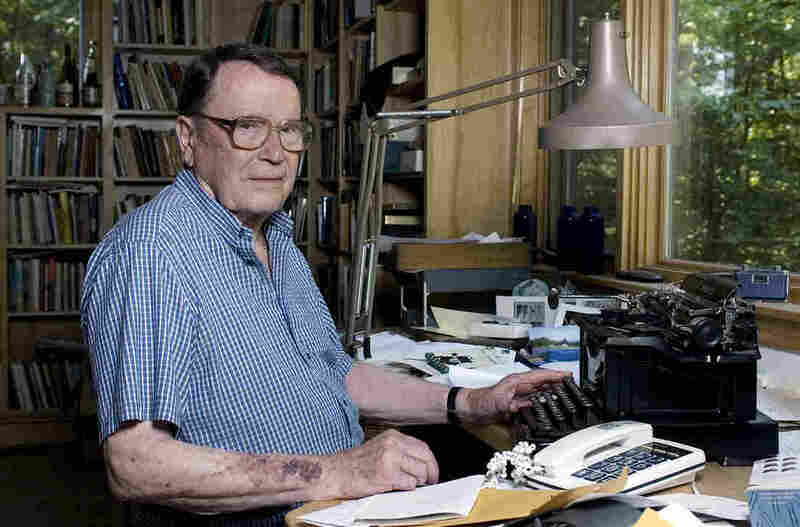 Richard Wilbur, Renowned American Poet And Translator, Dies At 96 : The Two-Way His commitment to traditional forms, with tight patterns and taut construction, stood out among his contemporaries. He said his craft was finding order in pain and chaos — not creating it. Poet Richard Wilbur, shown at his home in Cummington, Mass., in 2006, died on Saturday at the age of 96. Wilbur, a Pulitzer Prize-winning poet and translator, intrigued and delighted generations of readers and theatergoers through his rhyming editions of Moliere and his own verse on memory, writing and nature. Richard Wilbur, the former poet laureate and two-time Pulitzer Prize winner renowned for his elegant, exquisitely crafted formal poetry has died at the age of 96. Wilbur died on Saturday, with his family at his side, friend and fellow poet Dana Gioia told the Associated Press. He leaves behind a body of work that was showered with acclaim — in addition to his Pulitzers, Wilbur won the National Book Award, a National Medal of the Arts, the Bollingen Prize (twice) the Wallace Stevens Award, the Frost Medal, a Guggenheim Fellowship (twice), the T.S. Eliot Award, the Edna St. Vincent Millay Memorial Award, among others. He was renowned as a translator of French drama, transforming the work of Moliere and Racine into perfectly rhymed English. He also wrote the book for Leonard Bernstein's take on Voltaire's Candide. Wilbur wrote books for children, too, including several volumes of playful rhymes about "opposites" — an armadillo, as the opposite of a pillow, for instance. In 1991, when an NPR host asked Wilbur if the poet laureate ought to be writing such poetry, the poet laughed. "I have no fear of lowering myself," he said. But above all, he was famous for his mastery of so-called "traditional forms," tautly constructed and regularly rhymed. Fringing the woods, the stone walls, and the lanes, Old thickets everywhere have come alive, Their new leaves reaching out in fans of five From tangles overarched by this year's canes. Poetry like this — crystalline perfection in its form, with a tendency toward detachment — was not exactly fashionable for most of Wilbur's career. But as his colleagues pursued more experimental structures, he continued to work within the tight confines of the patterns he loved, to widespread acclaim. As that poem suggests, Wilbur's calm, orderly and reflective work was born out of the horror and uncertainty of World War II. He began taking poetry seriously as a soldier, during his three years in combat. "It was one of the few constructive things I could do with the long periods of idleness which military service involves — writing poetry was something to do," he told NPR's Fresh Air in 1989. "And then there was the general disorder and doubtfulness of the world. We didn't know, when our war against Adolf Hitler began, that we were going to beat him. We might have lived in a Hitler world for years thereafter, for all we knew. "And then there was the interior disturbance which even the bravest and securest of us felt at such a time," he said. "... all of that leads to the tendency of art — not to make things look nicer than they are but to face up to things, to clarify." "One does not use poetry for its major purposes, as a means to organize oneself and the world, until one's world somehow gets out of hand," he once wrote. But for Wilbur, the art of crafting poetry — and particularly his style of poetry, wrapping a perfect, certain pattern around imperfection and uncertainty— was not just an act of organizing chaos. It was as much about discovery as creation. "I feel that the universe is full of glorious energy, that the energy tends to take pattern and shape, and that the ultimate character of things is comely and good," he told The Paris Review in 1977. "I am perfectly aware that I say this in the teeth of all sorts of contrary evidence, and that I must be basing it partly on temperament and partly on faith, but that is my attitude. "My feeling is that when you discover order and goodness in the world, it is not something you are imposing — it is something which is likely really to be there, whatever crumminess and evil and disorder there may also be," he said. That is, creating a perfectly balanced, precisely rhymed poem about mortality or uncertainty is not holding pain at bay, but bringing it close. "One of the jobs of poetry is to make the unbearable bearable," he said, "not by falsehood but by clear, precise confrontation."